Researchers from the National Institute of Allergy and Infectious Disease (NIAID) used Imaris to better understand some of the processes that take place when an orthopoxvirus infects a cell. Orthpoxviruses include the viruses that cause smallpox, cowpox, monkeypox and mousepox. “The ability to surface render specific structures and easily extract statistical data from multiple channels is a powerful feature of Imaris that was instrumental to our study,” said Dr. Amanda Howard, who was a postdoc in Dr. Bernard Moss’s lab at the NIAID. When some orthopoxviruses infect cells the mature virus particles, or virions, become embedded within large cytoplasmic matrices called A-type inclusions (ATIs). The inclusion matrix is made of the protein ATIp, which is thought to protect the infectivity of virions. The researchers wanted to know how the virions become embedded in the ATIs. “We found that microtubules are important for the trafficking of individual virions to the ATIs and for coalescence of small ATIs into larger ones,” said Dr. Bernard Moss, Chief of the Laboratory of Viral Diseases at the NIAID, which is part of the National Institutes of Health. For their experiments, the researchers used mCherry fluorescent protein to label ATIp and yellow fluorescent protein (YFP) to label the viral core protein in live cells. Imaris let them reconstruct 3D images from confocal z-sections of the cells. They viewed images that showed both the mCherry and YFP fluorescence channels in Imaris Surpass mode to quickly identify ATIs that contained virions associated at the surface as well as those with virions embedded within, Imaris Slice mode also helped them distinguish between ATIs embedded throughout with virions from those that contained virions only at the surface. 3D models of coalescing ATI. Two ATIs (left panels) merge to form a single, larger ATI (right panels). The models were generated using Imaris Surfaces and are clipped in the bottom panels to show the distribution of virions in the ATIs. ATIs=red; virions=green; scale bar=2 microns. Image courtesy of Dr. Jiunn Fong. “The ease of toggling between the two image views is a very useful feature of the software,” Dr. Howard said. 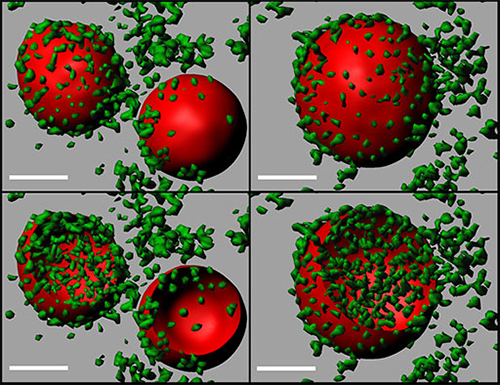 The researchers also used Surfaces (one of the four object tools in Imaris) to quantitatively study the effects of ATI coalescence on the accumulation of virions. They generated surface renderings of non-coalesced and coalesced ATIs and then extracted data from the ATIp (mCherry) and the YFP (virions) channels within the defined ATI using Imaris. Comparing volume data from the ATI channel with the accumulation of YFP fluorescence showed that coalescence embeds virions within the ATI matrix. Finally, they performed tracking with Surfaces and Spots (two of the four object tools available in Imaris) to quantitatively monitor the movement of individual virions to ATIs. Imaris revealed that mature virions move to associate with the surface of ATIs at speeds consistent with those observed for mature virions moving along microtubules to sites of wrapping. Overall, the image analyses showed that microtubules have an important role in embedding mature virions in the ATI matrix, ATI coalescence, and the transport of mature virions to ATIs. The researchers now want to determine how the ATI matrix protein is delivered from where it is synthesized to the inclusion bodies. “There are some clues that the mRNA is transported and translated in situ,” said Dr. Moss. Research Paper: Howard AR, Moss B. 2012. Formation of orthopoxvirus cytoplasmic A-type inclusion bodies and embedding of virions are dynamic processes requiring microtubules. J Virol. 2012 May;86(10):5905-14.